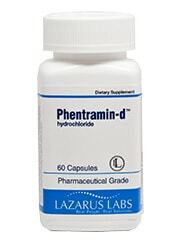 Phentramin-D Review (UPDATED 2019): Is It Safe? Phentramin-D Review: Is It Safe? Highlighted as being the best over the counter weight loss formula that claims to be scientifically tested and as strong as prescription strength pills. It’s said to be powerful as well as safe, working 24 hours and without any serious side effects. While there are a ton of bold claims provided, if what they say is true then this product has a lot to offer. Let’s see how these claims hold up! Lazarus Labs has offices rooted in Georgia and they offer over the counter drugs across the globe that are made in GMP certified factories. A complaint and review website has a few customers concerned over the supposed 30 day money back guarantee which was not accepted. These same customers reported no results and were left without a way to retain their money. A few things are said to occur. Insulin levels are stabilized which allows for less hunger pains. Metabolism is increased thru the stimulants provided which helps burn off calories quicker. The brain is then is fooled into thinking glucose is being absorbed which furthers the hunger reduction. This product also gives a boost in energy which is intended to be used alongside the necessary exercise and diet. Currently the makers offer diet plans and exercise tips to further progress. On their website is a banner meant to link to the scientific studies done on this supplement. However after clicking it, instead it redirected to a comparison to another supplement that has been banned in the US. They claim Phentramin-D to be a legal alternative with similar results. However the supposed clinical trials that were ran are not included. Very few reviews exist on the actual product outside of the website, the limited collected consensus rates this product as being possibly useless. There are a whole host of different stimulants found inside and there is no measured accurate dosage of each. Stimulant free and full disclaimed nutrition facts should be made attainable and in fact other products do offer this. 2-Phenylethylamine (PEA): Brain stimulant added to increase mood, performance and preserve function. In supplement form it is known to be poorly digested. 1,3, 7 trimethylxanthine: Chemical name for caffeine. Hordenine: Little research is known about this plant based stimulant is said to boost fat loss. Synephrine: Also has the name Bitter Orange, it may improve digestion and overall circulation however it is added to stave off fat. Yohimbine: Stimulant added to increase fat loss, it has noted potential for causing anxiety and only deemed useful during fasting. Potential Side Effects: Withdrawal symptoms, anxiety, difficulty concentrating, dehydration, frequent bathroom trips, insomnia, depression, mood swings, tremors, difficulty swallowing, sweating, increased heart rate, and stroke. Promises of being strong ring true with the amount of stimulants added, but it might not be what customers are looking for. What is concerning is that the product has mostly stimulants such as caffeine in unknown quantities. Their formula is mixed into a proprietary blend making it impossible to know how much of each ingredient is summed up in the total. With the rate of serious possible side effects this becomes extra problematic. Not knowing how much of these powerful ingredients goes into your body makes it a guessing game. The product claims to be pharmaceutical strength yet available to anyone not sensitive to caffeine. This fact is possibly even harsher as the ingredients found within can cause an overactive surge in some. For example Yohimbine has been shown to potentially cause severe anxiety and even worse, its potential for fat reduction has few studies to support its potential. A months supply of this product runs at $67 dollars, a concerning fact when you realize that some customers have reported the money back return was not accepted. Being powerful isn’t the only thing to look for, safety and effectiveness also play a necessary role. This product does not have any actual studies offered yet they claim they ran trails. They also do not provide a full listing of ingredient strength which is particularly troubling when considering the full list of stimulants. Furthermore with a high price and no way of knowing if the money back guarantee applies, there are far too many flaws to consider here. Phentramin-D has a lot to say but they offer very little in the way of evidence. Supplements that actually provide you with information and studies are now in circulation. By not knowing what exactly the strength is of these stimulant ingredients it is hard to know the risk of potential side effects. Instead of having to worry about potentially harsh ingredients we recommend an all natural solution for effective weight loss.